Peebles Rovers, in red and white, couldn't raise their game despite the fairly unique occasion. The crowd at Whitestone Park was swollen considerably by the attraction of Sunday football and the special occasion of ‘Groundhop Day’. The game was delayed by a day to allow dedicated travelling fans to complete a packed weekend of match attendance at various venues in the East of Scotland League, as the Groundhop UK group staged one of its Scottish visits. However, Peebles Rovers couldn’t make the most of the extra attention, going down 3-1 at home to Newtongrange Star. The Midlothian men opened the scoring after 12 minutes when a ball from Thomson found Kyle Lander on the right. He easily turned Gettel before driving into the box and squared for Sean Jamieson, who calmly slotted home. Porteous had a good chance after 22 minutes but headed over from 12 yards before Jamieson fired straight at the keeper after good work by Lander. Porteous glanced a Scott cross inch’s wide after 36 minutes before Scott doubled Star’s advantage on 40 minutes, when he raced on to a long ball and waited for it to bounce before smashing it past Tom Kerr. Peebles had their first effort on goal after 47 minutes but Grant Wilson sent it out of the ground. O’Hara fired in a dangerous cross after 51 minutes which evaded everyone inside the box. 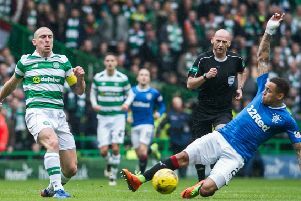 Star had claims for a penalty turned down when Porteous appeared to be pulled down in the box after 57 minutes. Lander brought out a brilliant fingertip save from Kerr after 62 minutes when he rolled his marker on the edge of the box before firing a stinging effort goalwards. Peebles pulled one back when Currie was short with a back pass, allowing David Lindsay to nip in and flick it past Dunsmore. A Hunter free kick was just scrambled behind for a corner from which a poor delivery almost led to a swift counter attack that Currie did well to block on the half way line. Star put the game beyond any doubt after 77 minutes when they deservedly got their third goal. A lovely diagonal ball by Thomson was brought down by Lander. His cross was turned in via the far post from a very acute angle by Porteous. Forster brought out an excellent save from Kerr after 80 minutes when he dived low to his left to turn away the Star striker’s effort, before O’Hara volleyed a Thomson corner inches wide.